Overdrive is the second draft set for Android: Netrunner Draft Play, consisting of 194 randomized cards collated from across a broad network of Android: Netrunner products – the Android: Netrunner Core Set, the Creation and Control deluxe expansion, the Honor and Profit deluxe expansion, and the first three cycles of Data Packs, including no fewer than forty-three cards drawn from the Lunar Cycle, which players will be able to add to their rigs or HQ before they’re even released in Data Packs! The Overdrive Draft Starter features 16 fixed cards that serve as the core of your Overdrive draft decks. A mix of essential agendas, icebreakers, and economy cards accompany rules for draft play and “draft only” identity cards for both Corp and Runner. The Overdrive Draft Starter is made available to you via Fantasy Flight Games in-house manufacturing, and you may reuse the contents of your Overdrive Draft Starter through any number of Overdrive draft events. 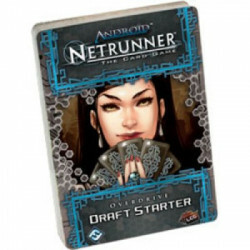 Bring the excitement of draft play to Android: Netrunner! Each player in a Overdrive draft will require three separate packs: One Draft Starter Pack – 11 cards and 2 IDs provides a fixed core of essential cards for both Corp and Runner One Corporation Draft Pack – a selection of 40 randomized Corp cards One Runner Draft Pack – a selection of 40 randomized Runner cards The cards in the Overdrive Draft Starter that are marked “draft only” are only legal within the draft play format. All other Overdrive draft cards can be found in standard Android: Netrunner LCG® products and are tournament legal while sleeved in opaque or art sleeves.